About three weeks ago, my fiance and I were privileged to visit the Shrine of Our Lady of the Island in Manorville, New York. This was my very first visit to a Marian shrine, and as a recent convert to the Catholic faith, I found a particular warmth to the shrine property (I’ll talk about my visit in another post). As we walked among the trees and rain, I was so happy to have a space to reflect upon Mary’s role in my Christian journey. much more to her than we could imagine,” I often pondered. Yet, my faith community viewed Mary as someone who was just “nice.” We would dress up as her for the Christmas play and someone would sing “Mary Did You Know?” On December 26th, Mary would go back into the Nativity scene box, never to be spoke of or seen again until after Thanksgiving. Unfortunately, many Protestants see Catholic devotion to Mary as unnecessary, or even worse, idolatrous. A friend once mentioned, “I just don’t like the Catholic emphasis on Mary. It takes away from Jesus.” To this, I responded by saying that Mary doesn’t distract us from Jesus. Instead, she shows us the way to her Son. For example, in John 2, we see the wedding feast at Cana. The wedding has run out of wine, and Mary tells Jesus this news. He replies with “Woman, what does this have to do with me?” Mary then responds to the servants, telling them, “Do whatever He tells you.” As the story concludes, Jesus performs His first miracle at Cana, turning water into the finest wine. This is a powerful testament to Mary’s example for Christians. It seems, rather than fume that Jesus won’t comply with her immediately, she is patient, turning to the servants, saying “Do whatever He tells you.” In one simple statement, Mary spoke the essence of Christian life: to follow Jesus and submit our will to His. In today’s world, following Jesus unconditionally is difficult. We have so many distractions: cell phones, social media, our work, plans, worries, and anxieties. It’s hard to follow Jesus when we are preoccupied in our minds with everyday monotony. As a personal example, I struggle with anxiety. Daily, I find myself worried over things both big and small. Little, nagging worries occupy my mind. Obviously, Holy Scriptures tell us not to worry. We are told not to fear (365 times, actually!). At yet, at this, I fail. In spite of my failures, each day, I like to remember the words of the Blessed Mother, just as she told the servants at Cana: Do whatever He tells you. These words encourage me to not worry and to put my trust in Christ. Mary always points you and I towards her Son, towards obedience towards Him, and to the knowledge of Him. I’m not a professional Catholic apologist or theologian, and there are so many more writings about Mary you could read that surpass my skill. However, for my Catholic and Protestant friends alike, remember that a Biblical Mary will always point you to Jesus, never to herself. As I stood in front of the shrine in New York, I was amazed at the detail. 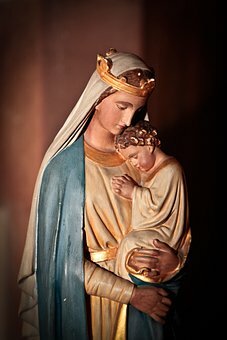 As Mary stood tall, she carried the infant Jesus in her arms. 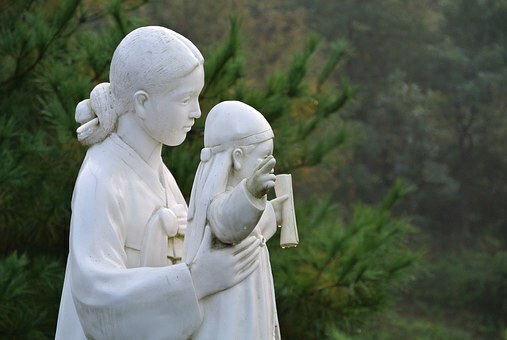 Rather than hold Jesus to the side, Mary held Him in front of her, the center of our visual focus. As I looked up, I said a prayer that day, thanking Our Lord His mother’s life and for her fiat. May you and I both, as the faithful on earth, always do as He tells us with joyful, hopeful hearts.